Hawaii is the archipelago of the Hawaiian Islands in the Pacific Ocean. Hawaii constitutes the 50th state of the United States, and as of the 2000 U.S. Census had a population of 1,211,537 people. 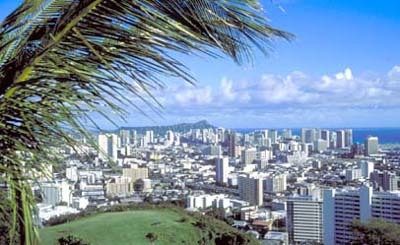 Honolulu is the largest city and the state capital. Mark Twain declared Hawaii to be 'the loveliest fleet of islands that lies anchored in any ocean', and not even thirty years of mass tourism have managed to prove him wrong. Whether your thing is volcano spotting, surfing or just lying back and smelling the orchids, this is the place to indulge yourself. Hawaii - the Aloha State - welcomes and seduces visitors with its frangipani-scented sea breezes and tropical warmth. This is where East merges with West in a blur of hula and disco, soap operas and creation myths, junk food and Japanese tea ceremonies, Shinto shrines and surf clubs. People: People: 32% mixed ethnicity, 22% Caucasian, 22% Japanese, 12% Filipino, 5% Chinese, 1% Hawaiian. Honolulu is the capital and largest city of the U.S. state of Hawai‘i. In the Hawaiian language, honolulu means "sheltered bay" or "place of shelter". "Honolulu County" is a county located in the state of Hawai'i, the official name of which is the City & County of Honolulu. It encompasses the island of O'ahu and several minor islands, including all of the Northwestern Hawaiian Islands (islands beyond Ni'ihau) except Midway Atoll. As of the 2000 Census the county population was 876,156. The county seat is Honolulu. Sure, it's got wide beaches, waving palms and balmy weather, but Honolulu ('Sheltered Bay') isn't just a stage-set for beachcombing. It boasts a 150-year history as the state capital and a beguiling multi-ethnicity that emerges most toothsomely in a feast of different cuisines. It might be part of the USA, but tropical Honolulu is more laid-back than any mainland capital. With its blend of sunny charm and legislative gravitas, the downtown area is surprisingly fascinating to explore - make the effort to drag yourself away from the Gidget-and-mai-tai scene. Honolulu is also fascinating anthropologically. It's a city full of ethnic minorities with no majority. This diversity can be seen on every street corner, and gives the city a wonderful, worldly feel. Anthropologists believe that Polynesians from the Marquesas and Society Islands first populated the Hawaiian Islands approximately 1500 years ago. They lived a rather peaceful life until, in 1000 AD, the Tahitians arrived and introduced their customs, religion and a strict social order. The first known Westerner to visit the islands was British explorer Captain James Cook, who arrived in 1778. Cook named the Hawaiian archipelago the Sandwich Islands, in honor of the Earl of Sandwich. At first, Cook was heralded as the legendary Lono, god of fertility and peace, but a freakish turn of events led to his fatal stabbing at Kealakekau Bay on the Big Island. After a series of battles that ended in 1795 and peaceful cession of the island of Kaua‘i in 1810, the Hawaiian Islands were united for the first time under a single ruler who would become known as King Kamehameha the Great. A witness to Cook's slaying was a fierce warrior, known as King Kamehameha or Kamehameha the Great, who was to unify the Hawaiian islands and establish the Hawaiian monarchy. Kamehameha engaged in lucrative trade with American sea captains interested in Hawaii's sandalwood forests. As more ships found their way to this new port of call, a foreign presence began to establish itself on Hawaiian shores. In the 1820s, Yankee whaling ships began calling on Hawaiian ports in search of wine, women and song, and for the next 50 years Hawaii was the centre of the Pacific whaling industry, bringing big money to the islands. The social excesses of the whalers were curtailed by the presence of Christian missionaries who befriended the Hawaiian royalty and introduced more 'refined' Western social mores. In the mid-1800s, descendants of the missionaries established Hawaii's sugar industry. The declining native population meant plantation owners soon began to look overseas for a labour supply. Labourers were recruited from China, then Japan, Portugal, Puerto Rico, Korea and finally from the Philippines. As Hawaii's sugar industry grew, the USA became more integral in the affairs of the Hawaiian islands. As a means of eliminating tariffs, the plantation owners announced a provisional government which eventually led to the overthrow of the monarchy and the establishing of Hawaii as a territory of the USA in 1900. The Newlands Resolution was passed on July 7, 1898, formally annexing Hawai‘i as a United States territory. In 1900, it was granted self-governance. Though several attempts were made to achieve statehood, Hawai‘i remained a territory for sixty years. Plantation owners, like those that comprised the so-called Big Five, found territorial status convenient, enabling them to continue importing cheap foreign labor; such immigration was prohibited in various other states of the Union. The power of the plantation owners was finally broken by activist descendants of original immigrant laborers. Because they were born in a United States territory, they were legal American citizens. Expecting to gain full voting rights, they actively campaigned for statehood for the Hawaiian Islands. Hawaii's importance to the USA grew as the US Navy established a huge military base at Pearl Harbor. The Japanese attack on Pearl Harbor on December 7, 1941, was the pivotal event that persuaded the USA to enter WWII. After the war, opinion polls showed that more than 90% of Hawaiian residents favoured US statehood. On August 21, 1959, Hawaii became the 50th state of the USA. The following years saw the development of Hawaii as a major tourist destination with numerous resorts, golf courses and shopping centres being built. To combat the increasing development, a number of state parks, wilderness sanctuaries and marine reserves have been established. In the 1970s, a Hawaiian cultural renaissance reasserted local cultural values in the face of tourist-brochure parodies. In the past few years, sovereignty has become a key political issue. While some Hawaiian groups favour the restoration of the monarchy, other native groups are calling for a Hawaiian nation within the USA and the return of crown lands taken during annexation. In November 1993, US President Bill Clinton signed a resolution apologising for the overthrow of the Hawaiian kingdom 100 years earlier. It is not known when Honolulu was first settled by the original Polynesians. Oral histories and artifacts indicate that there was a settlement where Honolulu now stands in the 12th century. However, after Kamehameha I conquered O‘ahu in the Battle of Nu‘uanu Pali, he moved his royal court from the Island of Hawai‘i to Waikiki in 1804. His court later relocated, in 1809, to where downtown Honolulu now stands. Around the time the first Europeans laid eyes on the archipelago, the Hawaiian Islands were under the control of a handful of chiefs who were fighting for dominance of the island chain. One of the main contenders was Kamehameha the Great, chief of the island of Hawaii. In 1795, Kamehameha swept through Maui and Molokai, conquering those islands before crossing the channel to Oahu. On the quiet beaches of Waikiki, he landed his fleet of canoes and marched to meet the king of Oahu. Under Kamehameha's command, a handful of Western sharpshooters picked off the Oahuan generals and blasted into their ridgetop defenses. Kamehameha's taking of Oahu marked Hawaii's emergence as a united kingdom. As foreign ships found their way to Honolulu, the port became a focal point for merchant ships plying the seas between North America and Asia. Captain William Brown of England was the first foreigner to sail, in 1794, into what is now Honolulu Harbor. More foreign ships would follow, making the port of Honolulu a focal point for merchant ships traveling between North America and Asia. In 1809, Kamehameha moved his royal court from Waikiki to the Honolulu Harbor area, which by then was a village of almost 1800 people. Intent on keeping an eye on all the trade that flowed in and out of the harbour, Kamehameha firmly established Honolulu as Hawaii's centre of commerce. In 1820, whaling ships plying the Pacific had begun to pull into Honolulu for supplies, liquor and women. To meet their needs, taverns and brothels sprang up around the harbour. Much to the ire of the whalers, their arrival was soon followed by that of Christian missionaries, who befriended Hawaiian royalty and made swift inroads. After Queen Kaahumanu became seriously ill, Sybil Bingham, one of the chief missionaries' wife, nursed the queen back to health. Kaahumanu showed her gratitude by passing a law forbidding work and travel on the Sabbath. The missionaries gained enough influence with Hawaiian royalty to have more effective laws enacted against drunkenness and prostitution. By the peak whaling years of the mid-1800s, most whaling boats had abandoned Honolulu, preferring to land in Lahaina on Maui, where life was not so wholesome. Back in missionary hands, downtown Honolulu soon became the headquarters for the emerging corporations that eventually gained control of Hawaii's commerce. It's no coincidence that their lists of corporate board members - Alexander, Baldwin, Cooke and Dole - read like a roster from the first mission ships. By 1845, the last son of Kamehameha the Great, Kamehameha III, moved the capital of the Kingdom of Hawaii from Maui to Honolulu. Here, Kamehameha III established Hawaii's first national legislature, provided for a Supreme Court and passed the Great Mahele land act, which established religious freedom and gave all male citizens the right to vote. In an 1853 census, Honolulu registered 11,450 residents, a full 15% of the Hawaiian kingdom's population. In the decades that followed, Honolulu began to take on a modern appearance as the monarchy erected a number of stately buildings in the city centre, including St Andrew's Cathedral, Iolani Palace and the Supreme Court building Aliiolani Hale. By the mid-19th century, Honolulu had a prominent foreign community comprised largely of American and British expatriates. As the city continued to grow, Westerners increasingly wrested control over island affairs from the Hawaiians. King David Kalakaua, who reigned from 1874 to 1891, was Hawaii's last king. A great Hawaiian revivalist, he brought back the hula, reversing decades of missionary repression against the 'heathen dance', and composed the national anthem, Hawaii Ponoi, which is now the state song. To many influential whites, however, the king was perceived as a lavish spender, too fond of partying and throwing public luaus. As Kalakaua incurred debts, he became increasingly unpopular with the sugar barons whose businesses were now the backbone of the economy. They formed the Hawaiian League in 1887 and developed their own armies which stood ready to overthrow the kingdom. In January 1893, Kalakaua's sister and successor, Queen Liliuokalani, was preparing to proclaim a new constitution strengthening the throne when a group of armed US businessmen occupied the Supreme Court and declared the monarchy overthrown. They announced a provisional government, led by Sanford Dole, son of a pioneer missionary, and immediately appealed to Washington for annexation, while the queen appealed to the same powers to restore the monarchy. Democrat president Grover Cleveland ordered that the US flag be taken down and the queen restored to her throne. However, the provisional government turned a deaf ear, declaring that Cleveland was meddling in 'Hawaiian' affairs. The Spanish-American War of 1898 and the acquisition of the Philippines marked the arrival of American expansionism in the Pacific. In short order, the annexation of Hawaii was adopted by the US Congress and, in 1900, US President McKinley appointed Sanford Dole the first governor of the Territory of Hawaii. Soon after annexation, the US Navy set up a huge Pacific headquarters at Pearl Harbor and in central Oahu built Schofield Barracks, the largest US military base anywhere. The military quickly became the leading sector of Oahu's economy. On December 7, 1941, the Japanese staged a surprise attack on Pearl Harbor that sank or seriously damaged 21 ships, killed more than 2300 people and catapulted the USA into the war. After the smoke cleared, Hawaii was placed under martial law and Oahu took on the face of a military camp. Already heavily militarized, vast tracts of Oahu's land were turned over to the US armed forces for expanded military bases, training and weapons testing. Much of that land has yet to be returned. On August 21, 1959, after 61 years of territorial status and following a currently contested plebiscite in which 90% of islanders voted for statehood, Hawaii became the 50th state of the USA, with Honolulu as its capital. An economic and tourism boom following statehood brought rapid economic growth to Honolulu and Hawaii. Modern air travel would bring thousands of visitors to the islands. Today, Honolulu is a modern city with numerous high-rise buildings, and Waikiki is the center of the tourism industry in Hawaii, with thousands of hotel rooms. Today, Honolulu is home to people from throughout the Pacific - it has no ethnic majority. It's also the state's centre of business, culture and politics, in addition to being one of the world's prime tourist destinations. The US state of Hawaii lies 2367km (1470mi) north of the equator and 4025km (2500mi) southwest of the nearest continental land mass, North America. The six main islands are part of a 128-island archipelago stretching 2452km (1523mi) from Kure Atoll in the northwest to the Big Island in the southwest. The main islands include Oahu, and the Neighbor Islands of Maui, Kauai, the Big Island (Hawaii), Molokai and Lanai. The islands are the tips of massive mountains, created by a crack in the earth's mantle which has been spewing molten rock for 25 million years. The Big Island, Hawaii's southernmost, is still in the birthing process. Its most active volcano, Kilauea, has pumped out more than two billion cubic yards of lava in the past 12 years. The native flora and fauna species of these isolated islands evolved with limited competition and few predators, so has fared particularly badly against more aggressive species introduced by early Polynesian settlers and Westerners. The islands are home to thousands of species, but of the 2400 native plant species remaining, almost half are endangered. It's a happier story in the sea. Hawaiian monk seals, dolphins and whales are year-round residents, though it's the huge, migrating humpback whales that everyone wants to see. Hawaii has only two national parks - Hawaii Volcanoes National Park and Haleakala National Park.